Gretta (formerly Ginger) and Addie both came to CNY from Texas. Gretta was adopted in June 2014, then Addie joined the family in January 2017. Their Mom is a long-time Helping Hounds volunteer. 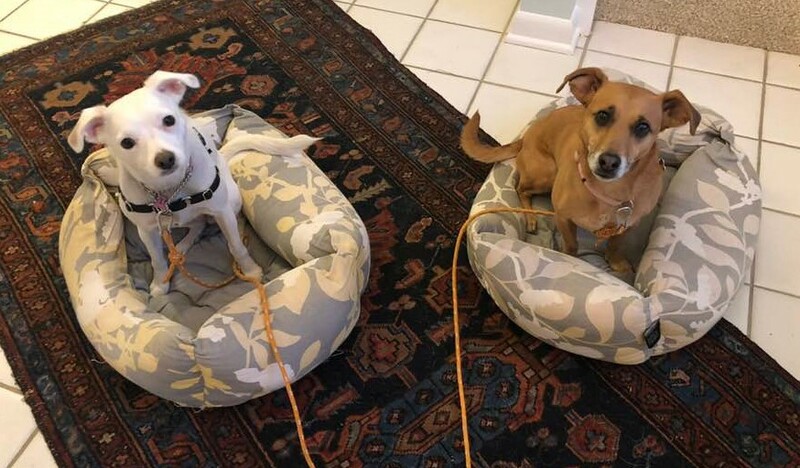 We are happy to share a pupdate on these sweet sisters. Gretta and Addie are spoiled rotten by their Mom and Grandma. Gretta’s favorite things include “cookies” (treats), snuggling under the covers, going for walks, and a special toy meant for large dogs that she screams for. Addie’s favorite things include her purple fleece blanket and enrichment toys and puzzles. These sisters are very busy pups-they go to work with Mom every day. They spend their Saturdays supervising farm chores while visiting Mom’s goat and horse. When they aren’t “working,” they enjoy being outside and going for long walks. One of their favorite places to hike and explore is the Cazenovia Art Park, which has lots of mud puddles to play in and toads to examine! They love traveling in the car and head for the door as soon as Mom says “Do you wanna...?” These girls are very smart, mastering many commands including sit, down, high five, and shake (both paws). Gretta also knows crawl and sit pretty,and Addie knows dance. They both do agility work, including jump, balance mat, sit-stay-spot, and tunnel. Gretta loves agility so much that if her Mom works out,she will bug her until Mom gets Gretta’s "workout" toys out!